← Cross-stitch on the move! 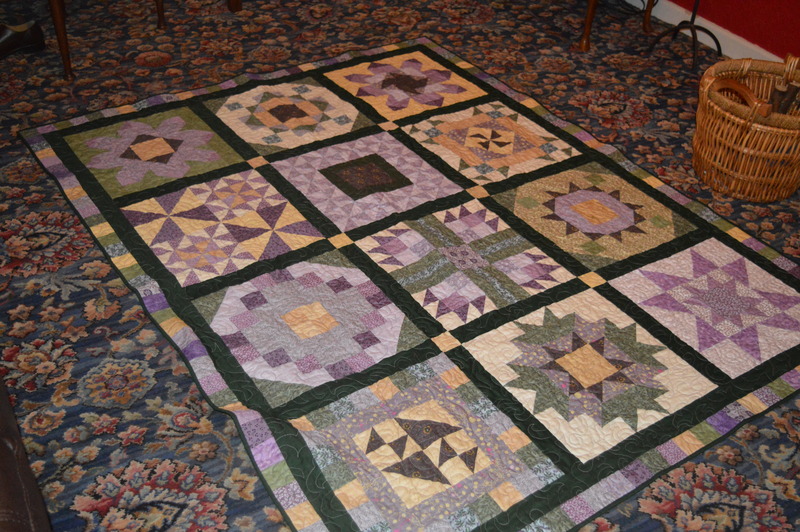 I’ve just finished one of the three Block -of -the-Month quilts that I’ve been stitching this year. I’m really pleased with it, love the design! It’s called ‘My Secret Garden‘ quilt, it’s designed by Pat Sloan and she releases the new block each month, it’s free too! This is the second BOM of her’s I’ve done (plus the Splendid Sampler that’s ongoing!) 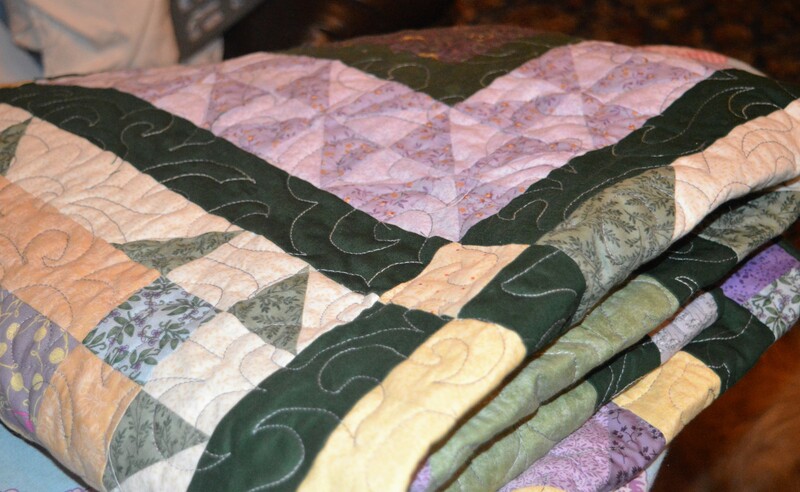 I find I learn so much from these quilts, they push me gently out of my comfort zone! Her instructions are great too, aimed at the beginner, which is fine by me! As there were both very light and very dark fabrics in green, cream and purple I decided to go for a variegated grey Gutermann quilting cotton. I hoped it would blend in nicely with all the colours. Typically the lightest bits of thread seem to be on the darkest fabrics and visa versa! Overall though I’m pretty pleased with the effect. 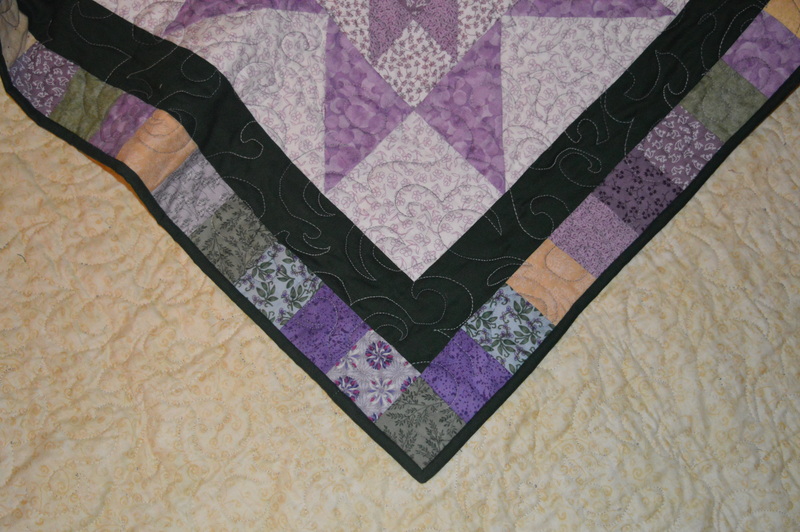 My quilting is definitely improving, either that or I have developed a pattern that suits my limitations! Basically I stitch like a meandering wave or leaf – a wiggle or a wave that finishes at a point. This allows me a space to stop and regroup. I tried to meander on previous quilts but I found it was when I stopped that the stitching became uneven, this way my stops are planned! I still haven’t quite got the tension right underneath, I put a fresh needle in after a few minutes which did help but the top thread is showing through underneath quite a lot. Any suggestions welcome! I’m going to give the quilt to my mum for Christmas, she has seen it whilst I was making it but she doesn’t know she’s getting it! I embroidered a label in purple and green variegated thread and stitched it on the back. 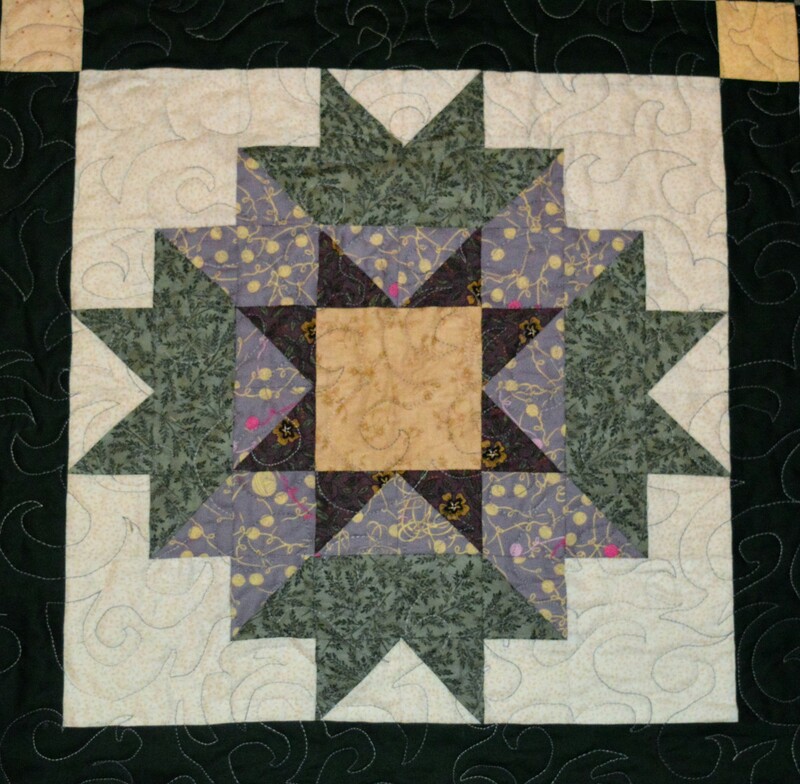 This entry was posted in Crafts, Quilting and tagged Free Motion Quilting, My Secret Garden. Bookmark the permalink. 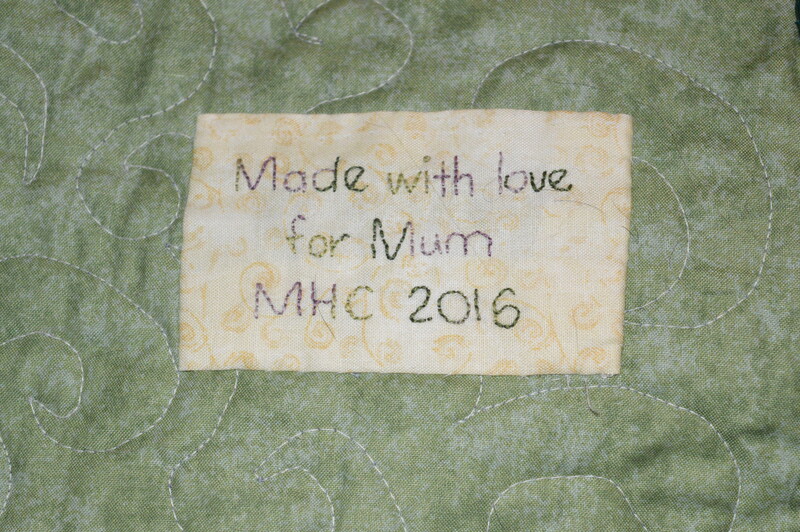 Lovely quilt & know your mom will be so pleased with it! You will be busy between now and December, won’t you?! It looks lovely, your mum will love it, Rachel and I love our quilts, the colours and binding fabrics complement beautifully, you always have a yood eye for colour.